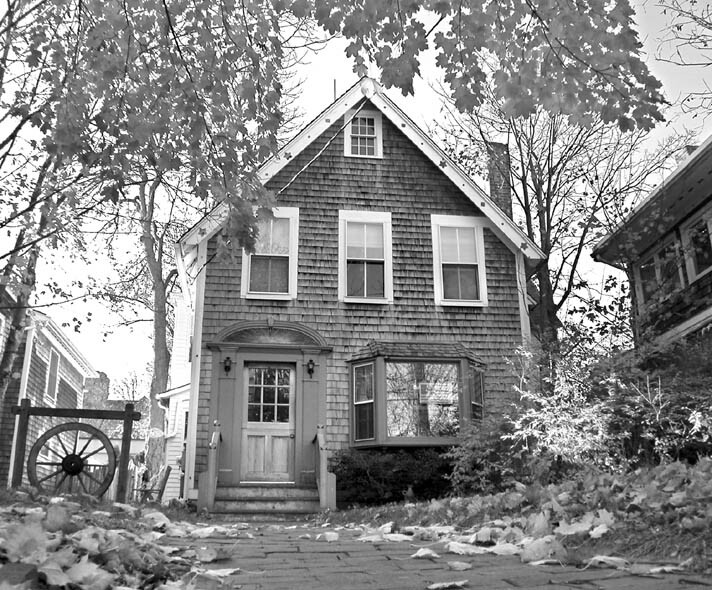 The following is a history of the buildings and businesses that have stood over the past century on the site of that little house set back between Cronig's Real Estate and the French restaurant, currently occupied by The Gypsy's Suitcase, on the west side of Main Street in Vineyard Haven, Mass. Widow Dunham's cottage. The fire hydrant visible on the right - the first in town - suggests that this photo was probably taken shortly after water was introduced to Main street in December 1887. 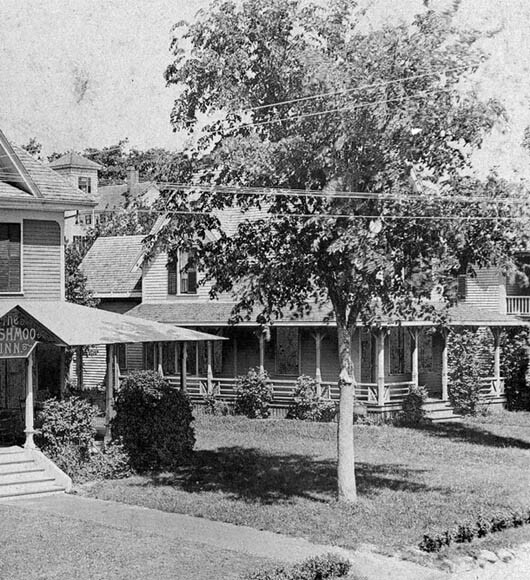 The porch of the Tashmoo Inn (Site #33) is seen on the extreme left, and Warren Luce's grocery (Site #35) is the large building on the right. RL: Yeah, well that's next, but Will Bodfish was in there with a grocery store, too. SL: Yeah, but that house is about the way it used to be, right today. RL: Yeah, hasn't changed too much. stood where it does now but looked quite different with a piazza, yellow paint and shutters." Before the 1870s, sites #34 and #35 comprised a single property owned by Peter and Polly Manter, and their dwelling house stood approximately where the Bagel Authority (#35) stands today. See Site #35 for more on the Manter family and their home. The first known structure at this location is Capt. Warren Luce's grocery store. It's not certain when he bought this property, but in June 1874 the Gazette reported that "Land is being broken opposite the Masonic Hall for a new store to be built quite soon, I am told, for Capt. W. Luce, one of our popular expressmen." The store stood right at the edge of Main Street, about sixty feet south of the corner of Drummer Lane. In September 1874, Capt. Luce sold the northern portion of his lot to William C. Dunham (see Site #35) but retained a small lot around his store and his rights to the cistern. In December 1874 the Gazette noted that Capt. Luce had recently moved into his new store. Capt. Warren Luce (1819 - 1907) was born in Tisbury, the son of Capt. Jesse Luce and Mary "Polly" Daggett, and the husband of Almira N. Crowell (1824 - 1907). "I was 85 years old on the second day of March, not a pain for months, my hair is dark and my whiskers not white. I am a sea captain, having been master of a vessel before I was 21. I am a Mason, a 'Forty-niner,' belong to the Boston society, a Ralstonite and a Methodist. "I have been six times around the world, three times around Cape Horn and back, eight or 10 times in New Zealand. I have been on both sides of Madagascar, five times in Australia, through Torres Straits, through the Java Sea to Siam, to Bangkok, three times through the China Sea to Hongkong, Macao, and have been 60 miles up the Saigon River. "Visited Shanghai, the Yellow Sea, through the straits of Corea, Japan Sea, Sandwich Islands to Alaska, whaling on our northeast coast. Sailed into all ports from San Francisco to Panama and have visited the Sandwich Islands four or five times. "I have also visited Pernambuco, Rio Janeiro, St. Catherine's, through Straits of Magellan, Elizabeth Bay and Little Fish Bay. I have been to Victoria, B.C., across the Gulf of Georgia to Burrill's Inlet, and took first load of lumber ever sawed in an English mill to Melbourne. "I have been to Cuba, Martinique, Barbadoes, Bermuda, the Azores and Cape Verde Islands, also to St. Helena, St. Paul's, Isle of France, Croxet and the Desolation Islands"
In early 1849 Capt. Luce is remembered to have organized the Rialto Mining Company, outfitted the little clipper schooner Rialto, and set sail from Holmes Hole for San Francisco and the California gold mines on Feb. 6, 1849 under the command of Capt. Charles Downs. In addition to Capt. Luce and Capt. Downs, three other Holmes Hole masters were among the party - Capt. William Merry, Capt. George B. Manchester, and Capt. Zenas Dillingham, as well as John Robinson. "The Rialto made the voyage to San Francisco in 135 days. Members agreed to mine in company units under the supervision of elected officers, with the understanding that every dollar earned by any member of the company by any means whatever, whether at the mines or by day labor, had to go into the common treasury. Although democratic in theory, the organization was not suited to the individualistic nature of the Yankee mariner and quickly broke down under pioneer conditions. The Rialto company retained its identity longer than most others. Its members actually tried the experiment of mining under the unit plan, but after one week at the diggings, it, too, followed the current pattern and dissolved. Despite misfortunes, which included being held in quarantine a week at St. Catherine's and the loss of a deck load of lumber in a gale, the company opened a store at San Francisco and disposed of its mixed cargo of merchandise at good profit. The Rialto made one round trip voyage to Peru under company auspices. 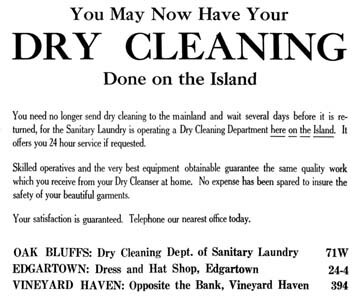 At time of dissolution each member of the company received a dividend of $2,200, a landfall when compared, for example, with the Vesta, also from Martha's Vineyard. That company, upon dissolution, paid $75. The Rialto was sold at San Francisco for use as a pilot boat." "And here the Rialto, also a pilot boat, which in 1849, Capt. Warren Luce, master, carried a party of gold seekers from the Vineyard to California, none of whom came home rich, or, in fact, came home at all, most of them dying with their boots on if tradition is correct." By 1870 Capt. Luce had retired from the sea. He operated a small express office and grocery store across the street (see Site #1) for a few years before building the grocery store at this site. In October 1879, the Gazette reported that Capt. Warren Luce had opened a grocery store on the Neck in the building formerly occupied by Dennis Dexter as a boat builder's shop, and that it was to be under the supervision of his son Francis Pope "Frank" Luce (1858-?). It's probable that this was only a branch shop, and that Capt. Luce continued to maintain his Main street grocery store himself. The 1880 census lists the 61-year-old Warren Luce as a "retail grocer," and a December 1881 article mentions "Capt. Warren Luce, the popular grocer of the village." In November 1882 there is a further mention of "Capt. W. Luce's store." Capt. Luce's grocery store burned down in the 1883 fire. He rebuilt next-door - see Site #35. On the fiftieth anniversary of the fire, an article in the Gazette recalled some of the unlikely things that panicked villagers rescued during the fire. The article noted that "Capt. W. A. Luce, whose store burned, saved a basket of summer savory." The Dunham / Bodfish cottage is visible behind the tree. Photo courtesy Dave Merry. Mary Dunham, whose home on the corner of Drummer Lane had burned down in the fire [see Site #35], evidently rebuilt her home at this location soon after the fire. The circa 1886 birds-eye illustration shows a sizeable house at this location, as does an 1888 real estate map. An August 1893 issue of the Gazette mentions "Mrs. Dunham's cottage, north of The Tashmoo." This was undoubtedly the building that stands at this location today. In November 1896, Mary Dunham sold this property to widow Polly Bodfish, whose son William had bought the neighboring property to the north the year before (see Site #35.) Polly deeded the property to her son three weeks after she purchased it, but she continued to live here. Polly (Crowell) Bodfish (1832-1911) was born in Yarmouth, the daughter of Ebenezer Crowell and Polly Downe. She had been married to blacksmith William Parker Bodfish (c1826-7 - 1882) who had once operated the livery stable business across the street (see Site #2.) The family had moved from Hyannis to West Tisbury about 1857-8, where Bodfish worked at the shop of Nathan Mayhew. They were the parents of the five well-known Bodfish brothers, Prentice the blacksmith, Josiah the dry goods merchant (see Site #30), Hartson the whaler (see Site #2), William the grocer (see Site #35 and below), and Eben the realtor. Polly was widowed by the time she purchased this property, and the 1900 census shows that Polly was living here with her son William who ran the grocery next-door, and his family. Polly died in 1911, at the age of eighty-three, of cirrhosis of the liver. The home was evidently inherited by William. Stan Lair said: "The home of William P. Bodfish. The house is still there, and looks very much like it always used to look, and run as a rooming house, I believe." William Parker Bodfish (1864-1924) was born in West Tisbury, one of the five sons of Polly Crowell and William Bodfish. He was married to Josephine R. Davis (1869-1947) who was the daughter of John Herman Davis (1832-1888) and Sophronia Mayhew Vincent (1832-1919) of Chilmark. They were the parents of Ruth (Bodfish) Fulton (1891-?) 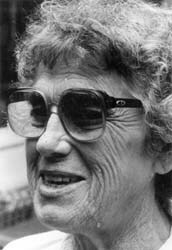 and Marion (Bodfish) Hancock (1893-1982). From 1895 until 1910 William owned and operated the Bodfish & Call grocery next-door (see Site #35) which later merged with the other village groceries to become Swift, Bodfish, and Swift Co. He was the president of S.B.S. at the time of his death. In 1913 William and Josephine deeded the property to Laura C. Bodfish, and in 1920 William's brother Eben Bodfish (1869-1944) was listed as the owner of the house. The 1920 census lists grocery and meat merchant William Bodfish living here with his wife Josephine and their 26-year-old daughter Marian (a teacher at an industrial school), together with fifty-year-old grocery salesman Eben Bodfish. 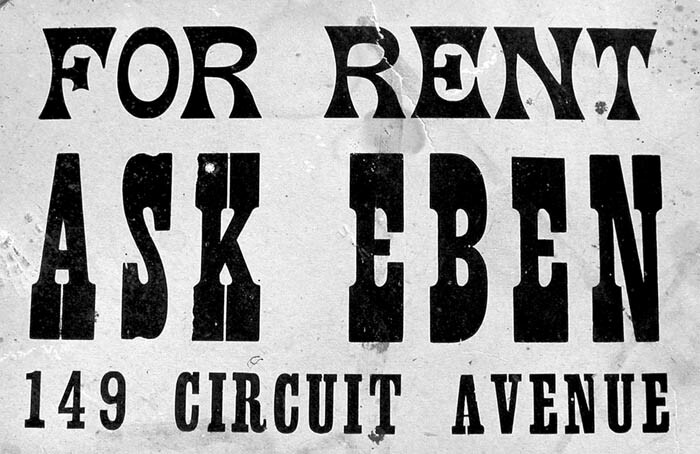 Eben Bodfish, a realtor, later became famous for his advertising slogan "Ask Eben." Although this building has been a private residence for most of its history, there it is evidence that a number of businesses were located here before World War II. It is, however, not always easy to determine which were located here and which were located next door in the Cronig Block (Site #33), as they were both often referred to as "opposite the bank." This is likely the same person as the Mrs. Mary F. Merrill (c.1894-?) 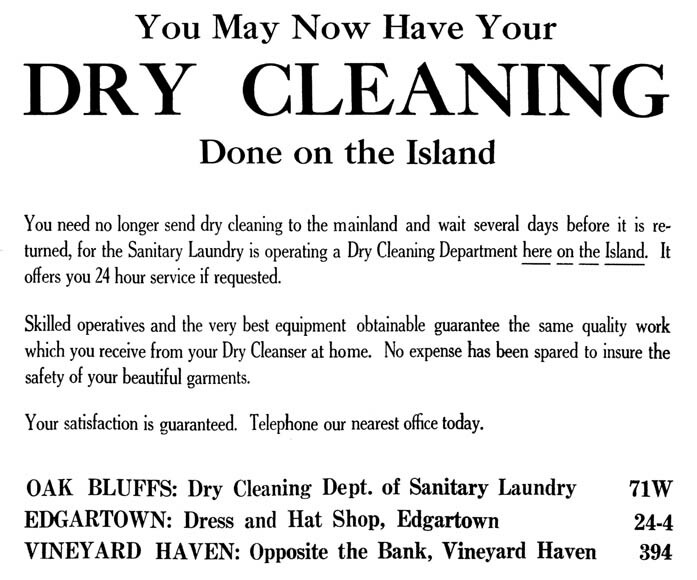 of Vineyard Haven who was reported in an October 1935 Gazette as suing her husband Charles E. Merrill, a Vineyard Haven poultryman, for divorce. 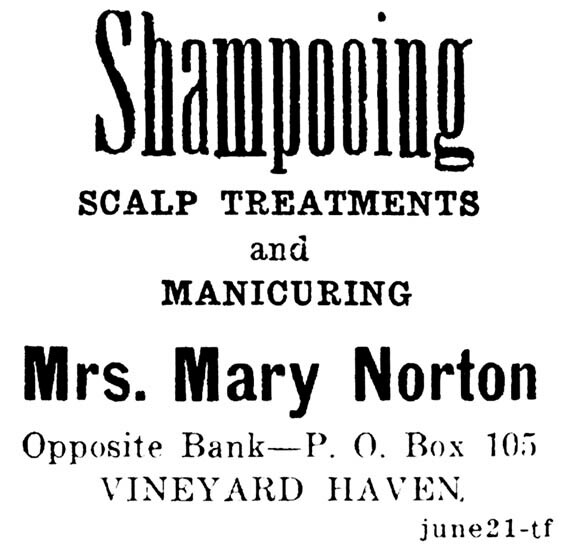 They had been married in Medford in November 1920, and had no children as of 1935. She had been born in Massachusetts to Irish immigrant parents. By June 1925 Ye Yarn Shoppe had opened a store on Main Street, "opposite the bank," presumably at this location. 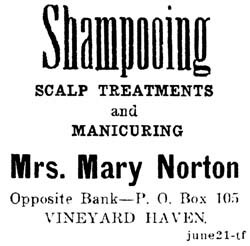 The first summer the shop shared space with Mae Merrill's shampooing business, and in October 1925 they advertised Christmas cards. 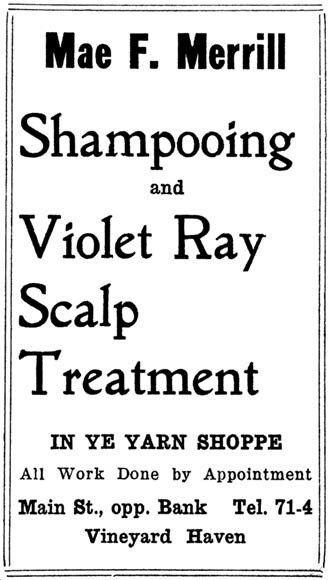 The following summer, Ye Yarn Shoppe advertised dresses, gowns, and sweaters. In January 1927 they held a "Closing Out Sale" of sweaters, wool and silk dresses, and yarns. Although they advertised that they were only closing "for the remainder of the winter" there is no evidence that they reopened. In March 1927 Roger Amidon moved his radio repair shop out of Site #26 and was "now occupying the building formerly known as Ye Yarn Shoppe," directly opposite the bank. "I believe the building between Cronig's real estate office and the French food restaurant was Roger Amidon's radio repair shop. I had used him to repair my radios. Roger Amidon repaired my RCA Victor and GE radios. He was very friendly, pleasant, etc." "My radio stations were WJC, WOR, WABC (NY stations were very clear) WEAN Providence etc. My first radio experience was at my neighbors set using ear phones this was about 1926-8. Stan [Lair] helped us build a ham radio good for ten miles, you could not use ham radios unless permitted. My favorite programs were Sunday news by Water Winchell, daily news by Lowell Thomas, H. V. Kaltenborn (he was unusual) during the ww2 i loved to hear E. R. Murrow. For fun I loved Jack Benny, Red Skelton and my favorite-Fred Allen. Music and bands were Glenn Miller, Wayne King and Guy Lombardo.and Glen Grey." "In my early experience with earphone radios in the mid 20's my favorite program each evening at 7:00 was 'Amos and Andy shows.' I still think they were the funniest, even later years I still listened to them in our RCA victor table model with Gothic shape cabinet." Roger Franklin Amidon (1901 - 1985) was the son of Rev. John F. Amidon and Susan Chase of North Tisbury. His first wife was Constance Carey Beetle (c.1909-1954) of Edgartown. 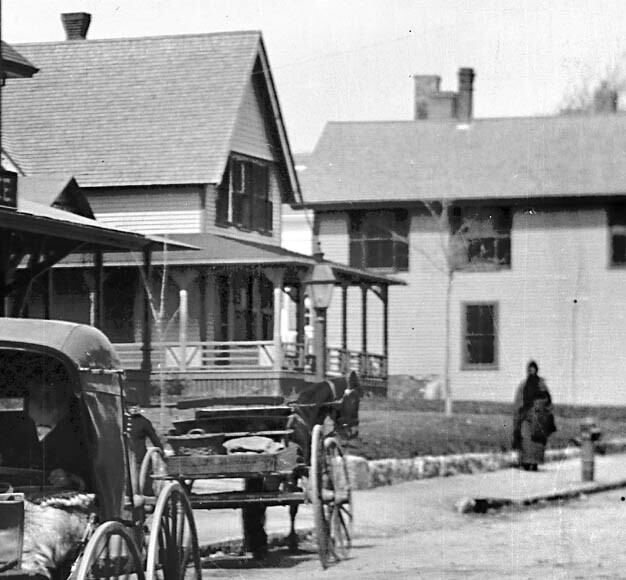 In 1920 he was evidently working as an auto mechanic in Boston. In July 1927 the Gazette reported that Amidon, who had been taking lessons at Boston Airport, was about to become the first civilian airline pilot on Martha's Vineyard. That fall, less than a month after his marriage, a student pilot crashed his airplane into Roger Amidon's car, injuring him. By October 1929, Amidon had evidently closed his radio shop and had gone to work at the Dukes County Garage on Water street. "Following her husband's death in 1924, Mrs. Bodfish opened up her home as a rooming house, although the title hardly describes the atmosphere of the temporary home which she provided for her guests and which endeared her to scores of people, for whom she provided throughout the year. She continued in this practice until the last, taking much pride in her ability to conduct her own business." Some today remember an elderly woman selling brown bread from this house. Property owner Josephine Bodfish died in 1947, and this building was sold to Bertha E. and Roger F. Amidon, whose residence is listed on the deed as Connecticut. In December 1947 Roger was mentioned in the Gazette as living in New Britain, Connecticut, and was hospitalized at the time. It's not clear if the Amidons ever lived here, but it apparently remained a private residence. Amidon died in 1985 in New Britain. His last residence was reported to be in Berlin, Connecticut, and his last job as a foreman in the Fafnir Bearing Company. County Commissioner Shirley (Kestenbaum) Frisch (?-1982) reportedly lived in this house after the death of her husband Joseph in 1972. By the late 1970s Bob Tankard, a physical education teacher at the Tisbury School, opened Coach T's, a tee-shirt shop, at this location, before moving across the street into the Ben Franklin building (See Site #2.) Tankard later became principal of the West Tisbury school. In October 1979, the property was sold by Antoine Matta and Stella J. Matta to John D. and Weit O. Bachellor. In the early 1980s, Educomp, a computer dealer and business supply store, was located here. It later relocated to the former telephone office at the intersection of Main and Beach streets. By 2001, The Gypsy's Suitcase was located here. The Gypsy's Suitcase, Thanksgiving Day, 2001.